Clarity is what we offer. Whether it's civil liability prevention in the current environment or officer safety or physical skills training you've never experienced before, we provide cutting edge training to meet your very real and evolving needs. Civil liability training: Working with best police attorneys and risk managers, we provide the training they want you to have. Integrated physical skills training: We took a path leading us to the only solution we've found that works. Integrated Combatives Problem-Solving© is the integration of the law/policy/ROE, Universal Tactical Principles©,and Applied OODA Theory© into every training concept to meet our end-user's very relevant needs. This synergizes every person's ability to flow in contextually correct, applicable, achievable, and ultimately more effective combatives application. Officer safety and survival: Not the same ol', same ol'. Instead, we provide principle-based officer safety principles that apply broadly across your spectrum of calls for service. We are constantly asked why everyone isn't teaching this way. We have to admit: we have no clue! Research--science, not anecdotes--is now proving how humans actually function in a combatives environment. We've been teaching for decades what science is now telling us about effectively training humans. We train you and your personnel to problem-solve combatives events in the same way our brains function, lessening the inevitable stalls in a fight. Then we teach you how to articulate your decision-making to prove your proper conduct. For the police. For the military. For responsible civilians. Everything we teach is evidence-based, all governed by our human limitations. And we teach you how to articulate and document your decisions. We come to you, lessening costs and maximizing your precious training time. CUTTING EDGE TRAINING's expert instructional staff serves as on-going mentors and consultants to agency and unit training teams all over the nation. Learn how we assist your instructors in growing beyond your expectations! We teach effective "primal functioning" in threat environments where there is a danger of "going primitive!" "Same 'ol, same 'ol" is something we have never heard in any evaluation. Always revolutionary. Practical. Tactical. And defensible. This is real-world, "GOOD-TO-GO" training of the highest order. Each course is solid in its content for the Tier-One operator, infantryman, or E&Eing aviator. We fill the gaps in your training, making you more survivable and more mission capable. 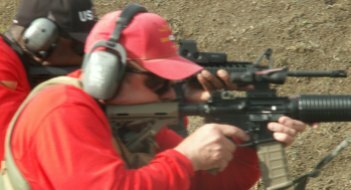 You want advanced training and tactics that give you a reliable edge over any violence aimed at you and yours. We offer only real world tactical training that is "cutting edge." More than a blog! Read the latest from our "Think Tank"
Designed from the street and field "in,"
not the mat-room or firing range "out." We positively impact your ability to prevail through mission capable, contextually relevant training. 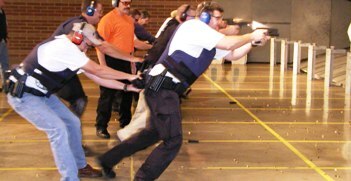 Each course is relentlessly honed to ensure applicability -- whether it is Effective Combatives Problem-Solving (handgun, rifle, shotgun, police Defensive Tactics, CQB, CQD, impact weapons, less-lethal, force-on-force, deadly force), civil liability prevention, or officer safety and tactics. This is the highest evolution of training possible...because it is training for those on the cutting edge. "Cutting Edge." There's a reason. Our track record of repeatedly developing revolutionary training that, years later, becomes the industry-wide standard--today's common sense--is why we are the "cutting edge of training." We functionalize what before has always been complicated, and present it in a "practical, tactical, and defensible" format that is instantly applicable to your real-world. Why wait ten years when you can be trained in tomorrow's concepts, tactics, and skills TODAY! The cutting edge of tactical, combatives, and liability prevention training! We prove it to you in every class we teach. We understand your "Bigger Picture." Service. Service to country; to community; to your family and children. Each day you commit and say, "No. To harm them, you must go through me. NO MATTER THE COST." That is your pledge. Your honor. Your integrity. Our sacred commitment is to YOU. You deserve our highest respect and efforts. Because you demand only excellence of yourself, we demand no less from ourselves. We do not believe in, "If it ain't broken, don't fix it." We are the innovators of instantly functional tactical and practical programs. We will continue to build on our record of life-saving performance for your Bigger Picture. Because your life matters to us. Apply Online! Apply to any of our classes by filling out our simple registration. Click here!